Milnec provides a full range of M85049 style backshells and accessories. Miltary connectors are designed for demanding applications in the harshest environments. You can improve their capabilities and ensure reliability by installing them with protective accessories. Strain relief cable clamps are best for reducing cable tension on a connector. EMI/RFI backshells are required for electronically sensitive applications. When disconnecting connectors, it is always important to protect the contacts and coupling mechanism with a cover. 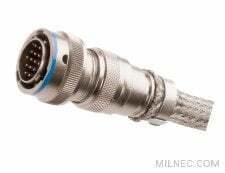 Milnec offers all of these accessories and more, compatible with all major mil-spec connector series. For additional help in specifying your M85049 style backshell or accessory solution, please contact a Milnec sales professional, or your authorized distributor for technical and sales support.